I’ve made many excuses this week, managing expectations a little too well. 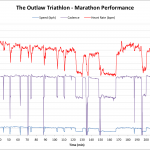 By Wednesday I’d even convinced myself and was ready to consign the Outlaw to training; no taper, no rest and no recovery. The following day’s ride made me revisit the question – testing my pacing plan, the numbers were good, but my legs felt tight and sore. I believed I could hit my target, perhaps I should put more into that goal. The week before had not gone to plan. With a second forty day block of cycling finished my training load had rapidly dropped. Unintentionally I’d already tapered and with it came the fear of lost fitness. 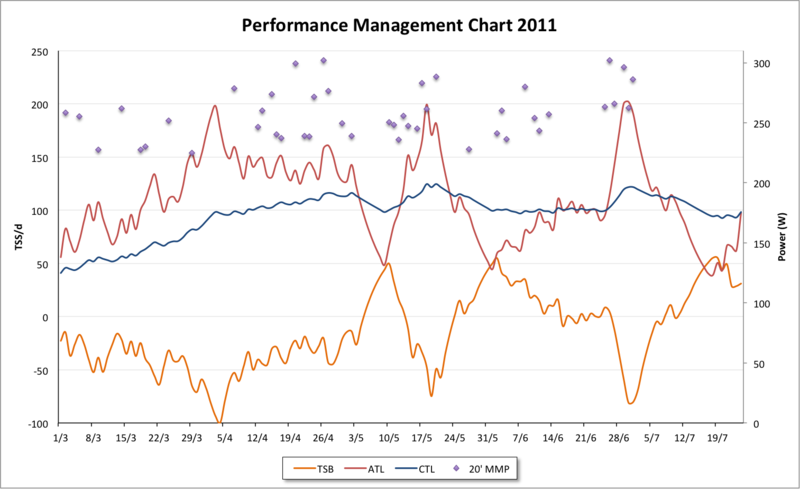 The Pyrenean peak in my Performance Management Chart was long gone. I knew actual performance mattered most, but still there were doubts. Train through and fitness would grow again, rest and it would decline; would I even be in good form? I put the graphs aside and went by how I felt. Taking the positives from Thursday’s bike I planned two easy days leading into the race. I would be very well tapered. The excuses are done. This is the race plan. Survival has always been my intention. Place myself near the front and hope I’ll be towed round the lake. A trip to the pool early in the week knocked my confidence, but swimming in Holme Pierrepont yesterday felt better. It won’t be my best swim, but I’m assured it’s fast so perhaps I can avoid a disaster. I’ll keep the effort controlled and attempt to let others do the work. I hope I can make it out in an hour, but wouldn’t be surprised to be slower. This is where my race begins. If I want anything from the day it’s a good measure of my cycling. I expect to see progress. The Powertap and disc cover are on the bike, I’ll be riding by power; my Garmin will display watts, heart rate, time and nothing else. My aim is to cap intensity at 250 watts. I’ve never raced at this level before. Death or glory, though I hope the alternative isn’t death. 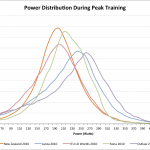 Power in training is higher and my test set demonstrated I could comfortably hold 250 watts for three sets of twenty minutes. 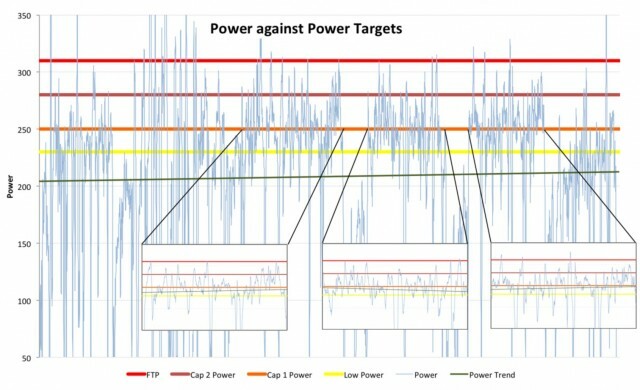 The chart shows that on each rep my power is neatly on target. 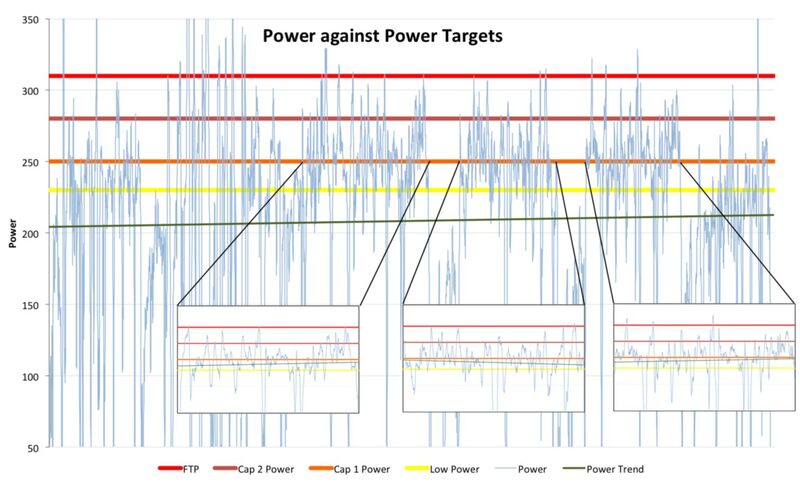 An hour at 250 watts split across intervals is not the same as racing for five hours at that intensity. This is a stretch, 240 watts would be a safer choice, but where’s the fun in that? I’m not concerned about the time, but knowing I’ve pushed harder on the bike is important. I believe I can sustain and fuel that effort, the real question is whether I can run after? My sandbagging has centred around running. There is no doubt I am not in shape to match some of my past performances. The technique work I’ve done with Kinetic Revolution is helping, but good technique can only go so far on minimal training. My legs lack the resilience to push a marathon. Run/walk is the safest option. I tried death or glory in Kona and it was painful. I will leave the recklessness of the bike behind and adopt a controlled, conservative approach. Aid stations are at least a mile apart so using them to time my walks should work perfectly. That gives me up to nineteen breaks over the marathon and more time to take in nutrition. Based on training pace and the flat nature of the course my optimistic estimate is a sub-3:30 marathon. 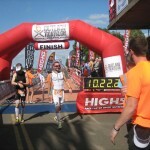 Should I feel in risk of injury at any point I will opt to walk more, but if I feel good on the last lap I will run. The lack of training leaves the outcome open. I’m racked and ready. I have a plan. I’ve done everything that can be done. One way or another tomorrow is going to be an interesting day. Now it’s time to relax.